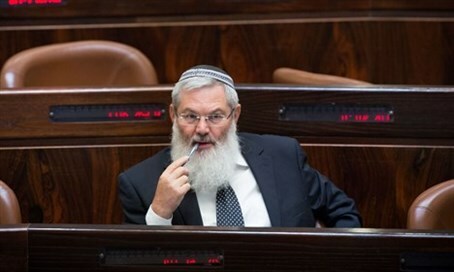 Rabbi Eli Ben-Dahan lashes out at Zionist Union no-confidence vote connecting 'settlements' to Price Tag attacks. Deputy Defense Minister Rabbi Eli Ben-Dahan (Jewish Home) used the Knesset plenum to accuse the Zionist Union party of attempting to smear the name of the Jewish community in Judea and Samaria. He was responding to the non-confidence vote of submitted by the head of the opposition Yitzhak Herzog (Zionist Union) regarding the issue of illegal building in Judea and Samaria communities, and the connection that such building has to so-called Price Tag attacks. According to Ben-Dahan, a large portion of the illegal building that is done on Palestinian land is destroyed by the division that oversees construction in COGAT (Coordination of Government Activities in the Territories). He cited a recent report published by the Knesset Institute for Research and Information, showing that more than 100,000 illegal buildings exist in Israel. That number does not include the illegal building of Palestinians in Judea and Samaria.